Ten years after invoking NATO's collective-security guarantee in the aftermath of Sept. 11, the alliance finds itself bogged down in Afghanistan, fighting a counterinsurgency campaign that few foresaw. For America's European allies, the war has transformed military doctrines, impacted national identities and brought down political coalitions. And still, European governments continue to struggle to justify their engagement in the face of a largely hostile public. Subscribers can download Kindle and PDF versions of this feature from the links on the top left of each component article's page (linked below). Not a subscriber? Sign up now. 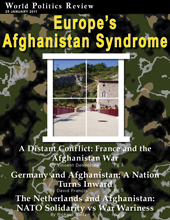 France's involvement in Afghanistan has primarily been met with indifference by French society. The French military, however, has come face to face with its limitations and has been forced to evolve. In addition to adapting its technology, France has faced a doctrinal evolution, acknowledging the rewened significance of communication, intelligence and ethics. Germany is fighting a war in Afghanistan in all but name. Constitutional prohibitions on warfare are joined by public opinion against involvement in the conflict to produce a government that denies the real nature of Germany's engagement in Afghanistan. The German government engages in campaign of willful ignorance to contradict reports that would dispute the official line. Nonetheless, Germany has been proactive in seeking to counter what it sees as a rising threat from radical Islam. The Dutch experience in Afghanistan illustrates the challanges of European governments fighting a counterinsurgency in the face of public opposition. Dutch troops operated in Afghanistan, largely in support of reconstruction efforts, from 2006 until the collapse of the Dutch government precipated a withdrawal in August 2010. Now the Dutch military may soon return to Afghanistan, one year after having become the first major NATO government to withdraw.